According to Tradition, the Virgin Mary was taken —presented—by her parents Joachim and Anna into the Jewish Temple in Jerusalem as a young girl, where she lived and served as a Temple virgin until her betrothal to St. Joseph. One of the earliest sources of this tradition is the non-canonical Protoevangelion of James, also called the Infancy Gospel of James. Sometimes Matins is served on the morning of the feast. The Gospel reading is from Luke 1:39-49, 56. It is read on all feasts of the Theotokos and includes the Theotokos' saying: "My soul magnifies the Lord and my spirit rejoices in God my Savior, for he has regarded the low estate of his handmaiden, for behold, henceforth all generations will call me blessed." Divine Liturgy is served on the day on the feast. The epistle reading is from Hebrews 9:1-7, and speaks of the tabernacle of the old covenant. The gospel reading is taken from Luke 10:38-42 and 11:27-28 together; this reading is also read on all feasts of the Theotokos. In it, the Lord says, "blessed are those who hear the word of God and keep it!" Troparion (Tone 4) Today is the preview of the good will of God, of the preaching of the salvation of mankind. The Virgin appears in the temple of God, in anticipation proclaiming Christ to all. Let us rejoice and sing to her: Rejoice, O Divine Fulfillment of the Creator's dispensation. Kontakion (Tone 4) The most pure Temple of the Savior; the precious Chamber and Virgin; the sacred Treasure of the glory of God, is presented today to the house of the Lord. She brings with her the grace of the Spirit, therefore, the angels of God praise her: "Truly this woman is the abode of heaven." Troparion (Tone 4) Today Anna bequeaths joy to all instead of sorrow by bringing forth her fruit, the only ever-Virgin. In fulfillment of her vow, today with joy she brings to the temple of the Lord the true temple and pure Mother of God the Word. 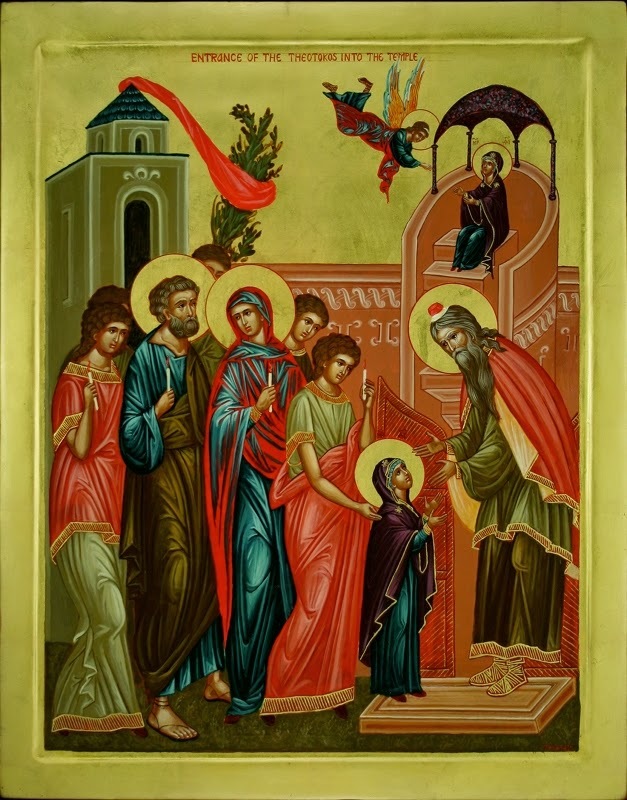 Kontakion (Tone 4) Today the universe is filled with joy at the glorious feast of the Mother of God, and cries out: "She is the heavenly tabernacle."